The accolade, from leading market researcher In-house Research, is based on survey responses of customers who completed on Bewley Homes’ properties in 2018. Of the 174 people who took part in the independent research, 94% said they would recommend the developer to others. 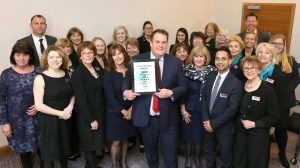 Bewley Homes’ managing director Andrew Brooks explained that it was the second consecutive year that the company had won the award. “Our 2019 score is an improvement on an impressive 91% the previous year,” he said. “This is testament to our hard work and the lengths we go to further improve the service and quality of homes that we provide to our customers. This exceptionally high level of customer satisfaction is one of the many reasons why our Bewley product is differentiated from other house builders. Founded in 1991, independent developer Bewley Homes has sites across Berkshire, Gloucestershire, Hampshire, Oxfordshire and Surrey. For more information, visit www.bewley.co.uk.